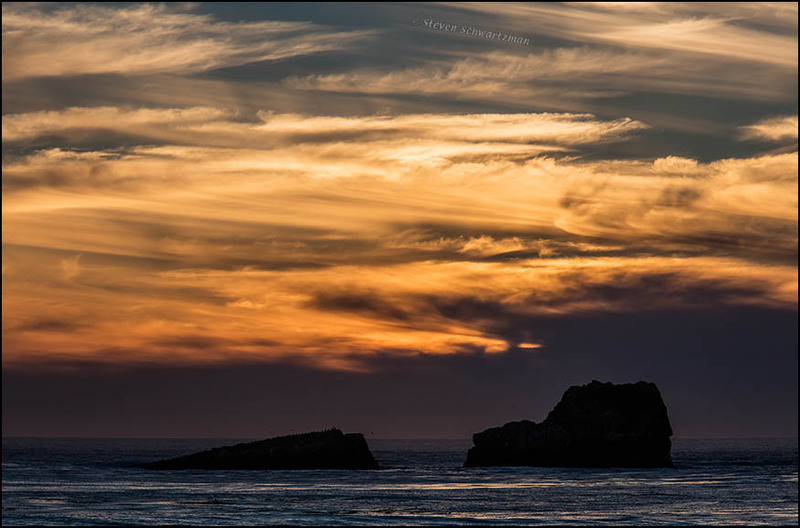 We arrived at the Piedras Blancas Elephant Seal Rookery near San Simeon, California, so late in the afternoon on November 4th that we soon got to enjoy a scenic sunset. While the distant rocks in the photograph that appeared here three days ago hosted seals, the rock at the left in today’s photograph attracted birds. Click the excerpt below if you’d like to zoom in on that silhouetted rock and its avian fringe. We’d also witnessed a good sunset at the Valley of Fire State Park in Nevada. It had plenty of rocks but no ocean. Pelicans! I understand they are in decline so it is awfully good to see them in such numbers. They are my favorite bird. This photo is just glorious, Steve. Ah, so those are pelicans on the rock. I wouldn’t have known, nor that they’re in decline, nor that they’re you’re favorite bird. We had three good sunsets on the trip that I can think of. The first was at the Valley of Fire State Park in Nevada and the last was near Guadalupe Mountains National Park in west Texas. Neither of those featured birds. Now I understand that they are making a comeback, for which I am thankful. I’m sorry to hear you only had 3 good sunsets. You did mention a lot of rain. Good for big trees, hard on photographers. It’s relative. Three sounds like a good number of sunsets to someone who lives in a place that doesn’t often get a fine sunset. Overcast skies or rain were with us for at least one-third of the trip. That’s not unusual for a drive that lasted six thousand miles, but it did make photography less than optimum on those days. There were plenty of things I imagined doing but couldn’t. Oh well, we make the best of what comes our way. I’ve thought about it some more and now I’d say we had 4 or 5 good sunsets. That’s why I left New York and headed south when still in my 20s. I’d still enjoy playing (photographically) with snow and ice but wouldn’t want to endure that for bleak months on end. The good news is that neither the brown nor the white pelican is listed as endangered now. The brown were delisted in 2009 due to recovery, and the white are listed as “of least concern.” They are protected under the Migratory Bird Treaty Act. It’s been fun watching them come back into my area over the last quarter century. They used to be an uncommon sight. Now? They’re everywhere, even fishing in the marinas where I work. Then we look forward to at least one pelican post brought to us from the Texas coast. Oh I’m glad to hear that. If it’s the one right before this, no. I suspect WordPress delayed slightly before displaying it. I’m glad it showed up. The sky gods busy with their paintbrushes! Yeah, you gotta hand it to those sky gods. Coming back down from such loftiness and going back to the subject of the previous post, this morning I saw an online video of a seal painting with a paintbrush that it held in its mouth. That’s a lot of birds!! Nice capture… it certainly pays off to be at the right place at the right time. Stunning! There could have been many more birds on this side of the rock or the far side of the rock but the only ones that showed up in the photograph in the dim light were the ones silhoutted along the crest and the few in the air. We’d spent a couple of hours at Point Lobos in the early afternoon and were sorry to hasten down the coast, but if we hadn’t we would have missed the seals and the sunset, so everything worked out fine. Your California sunset recalls a New Zealand sunrise. It’s beautiful. The burnished gold proves Tolkien’s point that “all that is gold does not glitter.” I especially like the way the clouds are curled and fringed, limning the stronger upper-level winds. It’s good of you to remember that New Zealand sunrise. As long as the sunset continued, and continued changing, I kept taking pictures. I see that I ended up with a little over a hundred photographs. I had a hard time picking just one for the post. I could’ve posted more but I generally avoid simultaneously showing variants of the same scene. That’s a wonderful cloudscape, well worth picking out from a large series. And, yes, that rock makes quite a perch. In addition to the pelicans (I’m also a big fan, I think I can see cormorants too (and gulls, of course). You see how little I know about such things: I wouldn’t have been able to say more than that they’re birds (except for the gulls). We were fortunate to have such a good sunset. Other frames were good too, but I wanted to show just one, and this one has the bonus of the rocks and the birds. Have you looked at clouds from both sides now?